Greek geographer Ptolemy (circa 90-168 AD) probably referred to Wari and Bateswar, two remote villages in Narsingdi, as Sounagoura in his "Geographia", said experts. The two villages are emerging as the seat of one of the earliest civilisations in Bangladesh with the unearthing of a 2,500-year old "fort city" featuring traits of commercial activities. "It is now considered that it is the rich and well-planned urban Wari-Bateswar which Greek geographer Ptolemy mentioned as Sounagoura," said Sufi Mostafizur Rahman, professor of archaeology at Jahangirnagar University (JU). Prof Sufi said in his book Ptolemy referred to some "emporia" including Arikamedu of India, Mantai of Sri Lanka, Kion Thom of Thailand, and Oc-Eo of Vietnam. The list also included the name of Sounagoura. All these places shared some common features--they are the most ancient civilisations of the respective regions, they were all river ports, and they produced monochrome glass beads, he added. 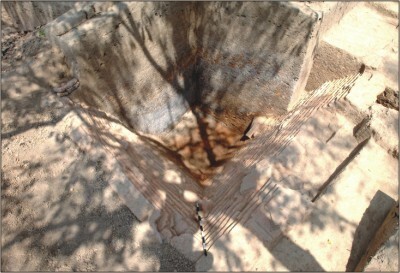 The artefacts excavated at Wari-Bateswar bear similarity with those found in these emporia sites, Prof Sufi said, adding that they are conducting further research to be certain of their assumption. Archaeologists said the geographical feature of the site and artefacts discovered here--silver punch-marked coins, different types of earthen pots, ironwares and semi-precious stone beads--prove that the place marked the second phase civilisation in the subcontinent dating back to around 500 BC. The first phase civilisation is Harappa and Mohenjo-Daro. An enthusiastic team of the JU archaeology department led by Prof Sufi have been carrying out the excavation at the site, 3km west of Belabo Police Station of Narsingdi, in phases since 2000. "The city surrounded by two-layer security walls and canals had an industry for making stone beads. The raw materials for those beads, however, did come from abroad, which is why we think that it was a commercial city," Prof Sufi said. "The most ancient silver punch-marked coins found at the site signify the possibility of a centre-controlled currency-based economy in the region," Sufi said. Etched beads and different earthenwares point to the possibility that there were commercial transactions with the South and Southeast Asia while for a specific kind of earthenware and sandwich glass beads it was with the Mediterranean Roman empire, he added. The landscape suggests that in ancient time the Brahmaputra, now a few kilometres east of the site, flowed near the village and was used for transportation. According to Banglapaedia, the location of the two villages on a comparatively high, flood-free ground, their proximity to the Brahmaputra at that time and access to the Meghna add significance to the site. Late Mohammad Hanif Pathan, a schoolteacher, first brought the archaeological importance of Wari-Bateswar to light in the 1930s. Later, his son Mohammad Habibullah Pathan took initiatives to collect antiquities and studied them. The artefacts unearthed at the site during January-April this year were unveiled on Thursday to guests and journalists at a programme organised by archaeological research centre Oitihya Onyeswan. GrameenPhone has been sponsoring the excavation, the next session of which is expected to begin in September. During this year's excavation, archaeologists unearthed a road, first found during the 2004 excavation, stretched up to 31 metres. The road bears signs of habitation on both sides, Prof Sufi said. The session's most stunning discovery was, however, a brick-built structure measuring 32x18 square feet thought to be part of a temple around 2,000-2,500 years old. The age of the structure will be ascertained after carbon-14 test, said Sufi, adding that various kinds of sample from the site are being sent to different places both inside and outside the country for laboratory tests. Habibullah Pathan, historian Prof Muntassir Mamun, artist Hashem Khan, journalist-writer Shahriar Kabir, GrameenPhone New Business Division Director Kafil HS Muyeed and JU professor of archaeology AKM Shahnawaz were present at Thursday's programme. Speakers said at the programme that without the wholehearted interest, integrity and cooperation of Habibullah Pathan and his father, the excavation of the 600x600 square feet area would not have been possible. Muntassir Mamun said the Wari-Bateswar fort city is more or less of the same period as the country's another ancient seat of civilisation, Mahasthangarh of Bogra. He proposed establishing a museum at the site to preserve and exhibit the artefacts and name it after the father and son. Muyeed promised to provide necessary financial support for the excavation and building a museum at Wari-Bateswar.